Carbonaceous chondrites or C chondrites are a class of chondritic meteorites comprising at least 8 known groups and many ungrouped meteorites. They include some of the most primitive known meteorites. The C chondrites represent only a small proportion (4.6%) of meteorite falls. 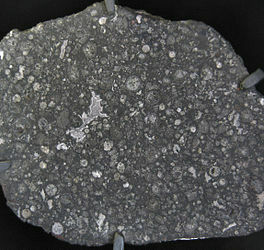 A slice of the Allende meteorite showing circular chondrules. Some famous carbonaceous chondrites are: Allende, Murchison, Orgueil, Ivuna, Murray, Tagish Lake, and Sutter's Mill. Some carbonaceous chondrites. From left to right: Allende, Yukon and Murchison. Carbonaceous chondrites are grouped according to distinctive compositions thought to reflect the type of parent body from which they originated. These C chondrite groups are now each named with a standard two-letter CX designation, where C stands for "carbonaceous" (other types of chondrites do not begin with this letter) plus a capital letter in the spot X, which is very often the first letter of the name of a prominent meteorite—often the first to be discovered—in the group. Such meteorites are often named for the place where they fell, thus giving no clue as to the physical nature of the group. Group CH, where H is for "high metal" is so far the only exception. See below for name derivations of each group. Several groups of carbonaceous chondrites, notably the CM and CI groups, contain high percentages (3% to 22%) of water, as well as organic compounds. They are composed mainly of silicates, oxides and sulfides, with the minerals olivine and serpentine being characteristic. The presence of volatile organic chemicals and water indicates that they have not undergone significant heating (>200 °C) since they were formed, and their compositions are considered to be close to that of the solar nebula from which the Solar System condensed. Other groups of C chondrites, e.g., CO, CV, and CK chondrites, are relatively poor in volatile compounds, and some of these have experienced significant heating on their parent asteroids. This group, named after the Ivuna meteorite (Tanzania), have chemical compositions that are close to that measured in the solar photosphere (aside from gaseous elements, and elements such as lithium which are underrepresented in the Sun's photosphere by comparison to their abundance in CI chondrites). In this sense, they are chemically the most primitive known meteorites. CI chondrites typically contain a high proportion of water (up to 22%), and organic matter in the form of amino acids and PAHs. Aqueous alteration promotes a composition of hydrous phyllosilicates, magnetite, and olivine crystals occurring in a black matrix, and a possible lack of chondrules. It is thought they have not been heated above 50 °C (122 °F), indicating that they condensed in the cooler outer portion of the solar nebula. Five CI chondrites have been observed to fall: Ivuna, Orgueil, Alais, Tonk and Revelstoke. Several others have been found by Japanese field parties in Antarctica. In general, the extreme fragility of CI chondrites causes them to be highly susceptible to terrestrial weathering, and they do not survive on Earth's surface for long after they fall. This group takes its name from Vigarano (Italy). Most of these chondrites belong to the petrologic type 3. The group takes its name from Renazzo (Italy). The best parent body candidate is 2 Pallas. "H" stands for "high metal" because CH chondrites may contain up to as much as 40% of metal. That makes them the most metal-rich of any chondrite group. The first meteorite discovered was ALH 85085. Chemically, these chondrites are closely related to CR and CB groups. All specimens of this group belong only to petrologic types 2 or 3. Gujba meteorite, a bencubbinite found in Nigeria. Polished slice, 4.6 x 3.8 cm. Note the nickel-iron chondrules, which have been age-dated to 4.5627 billion years. The group takes its name from the most representative member: Bencubbin (Australia). Although these chondrites contain over 50% nickel-iron metal, they are not classified as mesosiderites because their mineralogical and chemical properties are strongly associated with CR chondrites. This group take its name from Karoonda (Australia). These chondrites are closely related to the CO and CV groups. The group take its name from Ornans (France). The chondrule size is only about 0.15 mm on average. They are all of petrologic type 3. Ehrenfreund et al. (2001) found that amino acids in Ivuna and Orgueil were present at much lower concentrations than in CM chondrites (~30%), and that they had a distinct composition high in β-alanine, glycine, γ-ABA, and β-ABA but low in α-aminoisobutyric acid (AIB) and isovaline. This implies that they had formed by a different synthetic pathway, and on a different parent body from the CM chondrites. Most of the organic carbon in CI and CM carbonaceous chondrites is an insoluble complex material. That is similar to the description for kerogen. A kerogen-like material is also in the ALH84001 Martian meteorite (an achondrite). The CM meteorite Murchison has over 70 extraterrestrial amino acids and other compounds including carboxylic acids, hydroxy carboxylic acids, sulphonic and phosphonic acids, aliphatic, aromatic and polar hydrocarbons, fullerenes, heterocycles, carbonyl compounds, alcohols, amines and amides. ^ Bischoff, A.; Geiger, T. (1995). "Meteorites for the Sahara: Find locations, shock classification, degree of weathering and pairing". Meteoritics. 30 (1): 113–122. Bibcode:1995Metic..30..113B. doi:10.1111/j.1945-5100.1995.tb01219.x. ISSN 0026-1114. ^ a b Norton, O. Richard (2002). The Cambridge Encyclopedia of Meteorites. Cambridge: Cambridge University Press. pp. 121–124. ISBN 978-0-521-62143-4. ^ a b Ehrenfreund, Pascale; Daniel P. Glavin; Oliver Botta; George Cooper; Jeffrey L. Bada (2001). "Extraterrestrial amino acids in Orgueil and Ivuna: Tracing the parent body of CI type carbonaceous chondrites". Proceedings of the National Academy of Sciences. 98 (5): 2138–2141. Bibcode:2001PNAS...98.2138E. doi:10.1073/pnas.051502898. PMC 30105. PMID 11226205. ^ Wing, Michael R.; Jeffrey L. Bada (1992). "The origin of the polycyclic aromatic hydrocarbons in meteorites". Origins of Life and Evolution of the Biosphere. 21 (5–6): 375–383. Bibcode:1991OLEB...21..375W. doi:10.1007/BF01808308. ^ Nemiroff, R.; Bonnell, J., eds. (28 April 2012). "Sutter's Mill Meteorite". Astronomy Picture of the Day. NASA. Retrieved 2012-05-06. ^ Pearce, Ben K. D.; Pudritz, Ralph E. (2015). "Seeding the Pregenetic Earth: Meteoritic Abundances of Nucleobases and Potential Reaction Pathways". Astrophysical Journal. 807 (1): 85. arXiv:1505.01465. Bibcode:2015ApJ...807...85P. doi:10.1088/0004-637X/807/1/85. ^ Norton, O. Richard (2002). The Cambridge Encyclopedia of Meteorites. Cambridge: Cambridge University Press. p. 139. ISBN 978-0-521-62143-4. Gilmour, I.; Wright, I.; Wright, J. (1997). Origins of earth and life. Bletchley: The Open University. ISBN 978-0-7492-8182-3. Wikimedia Commons has media related to Carbonaceous chondrites.